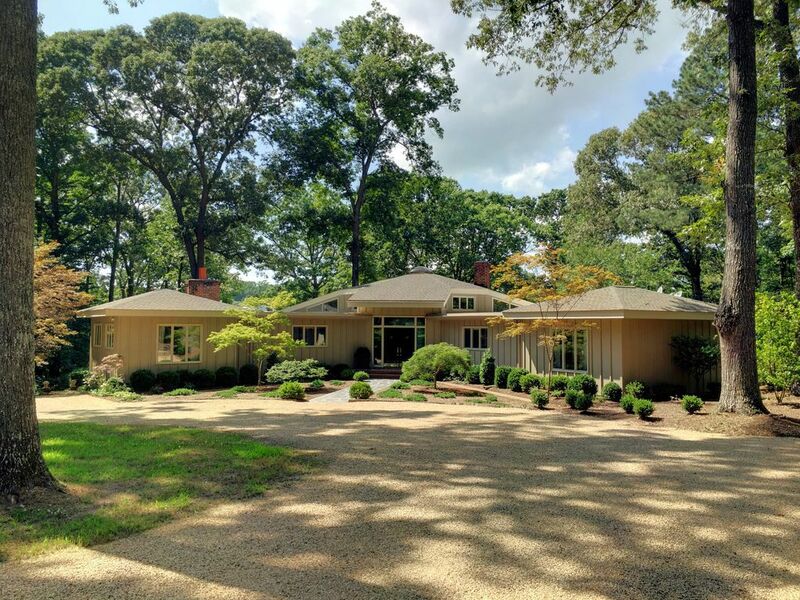 Located on 6 private acres, Treetops is an elegant and beautifully decorated contemporary home surrounded by park-like grounds and extensive views of the Corotoman River. The more than 4,000 square foot home features a large and plush living room with a beautiful view of the garden and river and an elegant dining room that comfortably seats 12. There are two ensuite and very private master bedrooms on the east side of the house along with a cozy library with a wood burning fireplace, comfortable seating, television and an extensive book collection. The west side of the house features a newly remodeled chef's kitchen with Sub-Zero and Wolf appliances and leads to a breakfast room which opens to the stone terrace, a large TV/family room, a laundry/mud room, and two additional bedrooms and shared bath. A stroll through the lovely rear garden leads to the pool and pool house with a large living and dining area and an additional bedroom and bath. From the pool house, a mulched path leads to the dock where fishing, kayaking, paddle boarding, canoeing, and peaceful sunset watching is available for your pleasure. A 13' boat is available for exploring the extensive and gentle waterway. My partner, Frederick Comer, and I own and operate antiques and interiors shops in Kilmarnock and Charlottesville, VA and work as interior designers as well. Originally from Washington, DC, we discovered the Northern Neck 20 years ago. Lured by it's simple charms, we become permanent residents in the last 6 years. We love the area and hope you will too. Treetops is an exceptional property with park-like grounds and a unique and contemporary home designed by renowned Charlottesville, VA architect, Milton Grieg in the 1970's. The house was in need of some updating when we purchased it but we have made great strides in doing so and continue to improve the details of the home and garden. The expansive views of the garden and river through exceptionally large windows and extensive use of skylights throughout the house allows for feeling of living in the treetops. The garden and waterfront are truly exceptional. 4 bathrooms total. One for each master bedroom, 1 for shared bedrooms and one in the pool house. Beautiful, exquisite property! Could not recommend more highly. Beautiful well equipped home. Large pool. Beautiful landscaping. The owner made us feel very welcomed in this large river front home. We were even allowed to use the Boston Whaler, paddle boards and kayaks. The kitchen is very well equipped and easy to cook in. The house is beautifully decorated. The small town of Kilmarnock is nearby with restaurants, Food Lion, antique shops, and an ice cream shop. The house had all amenities one could ask for and more. All of the best quality. The house is fantastic. Maintained to the highest standard. I admire the corage of the owners to rent it taking into account the shear volume of art :-) the quality of equipment is like one is in their own kitchen (at least it was my feeling). The location is superb. The lake the guest house, everything was superb. Gorgeous property and impeccably maintained. Our family shared a wonderful vacation at this beautiful home. The pool and water toys made for much fun. The beautifully furnished home and pool house made for a most comfortable, restful time.. The home owners and property manger attended to every detail and responded to every request/question so very quickly. If you are looking for that "special place", Treetops is it!! Mark - The time spent at your lovely home was perfect for our group of golfing ladies. Close proximity to the golf courses, delightful pool to swim in and well appointed kitchen to cook our meals. There were a number of women that took advantage of the paddle board. Donna, the caretaker, took good care of us and immediately responded whenever we had a question. You have a beautiful home in a beautiful setting. Thank you so much. Treetops is located just outside the quaint Chesapeake Bay-side town of Kilmarnock and near the waterfront towns of Irvington and White Stone. The rural nature of the area provides beautiful unspoiled areas for long walks, biking and scenic drives. The calm, protected waters provide exceptional kayaking, paddle boarding, fishing and boating. There are two public golf courses within 5 miles and the renown Tides Inn Resort is just 5 miles away. The historic area is located about an hour's east of Richmond and an hour's north of Colonial Williamsburg. The activities available at our home provide for a full resort-like vacation with plenty of places for rest, relaxation and peaceful pleasures.